The Danbury outdoor track team won the FCIAC, Class LL and State Open titles this spring. 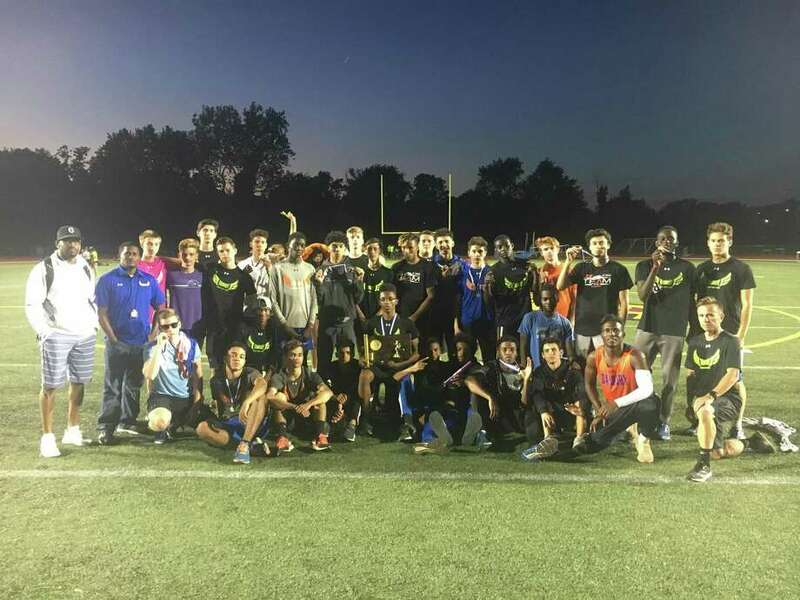 Hundreds have passed through the Danbury High boys cross country and track and field programs over the past two decades, many of whom have gone onto success at the collegiate level. One of the few constants is the reason why. For head coach Rob Murray — who graduated DHS in 1988 and has run all three teams since 2000 — turning the Hatters into a force wasn’t something he expected when he made the program his own. But with the amount of hardware claimed in the last several seasons, it’s hard to argue that anyone other than the Hatters are atop the state mountain now. The amount of championships since the turn of the century is staggering: Danbury has amassed 14 cross country, 12 indoor and 16 outdoor titles in the FCIAC alone. Plenty of state championships decorate the trophy case at Danbury, too. A self-described mad scientist who once had hopes to work for NASA analyzing the effects of space on the human body, Murray — an All-FCIAC cross country runner his senior season — was primarily a personal trainer after graduating from Southern Connecticut State University. He then volunteered for the track teams at Danbury before taking the reigns as head coach along with Marty Ogden. Murray — who has taught physical education at Danbury for almost 10 years and has completed several marathons — studied the local greats of the sport, including Staples High legend Laddie Lawrence and Bob Michalski of Xavier. The analytical part of the sport was the most appealing given his background, and it’s something he’s passed along to his athletes. Individualized training and tactical race planning are just two benefits of Murray’s ideology. Danbury soon went from the hunters to the hunted. The Hatters have won all but two FCIAC outdoor titles since 2001, and all but four indoor and cross country titles. The Hatters’ glory years — everything is relative when it comes to this dominant of a program — came in the mid-2000s. Danbury — which was preseason No. 1 in the nation — took home the New England championship in cross country and finished fifth nationally. During that period, Danbury swept the FCIAC, Class and State Open championships for three straight years across the cross country, indoor and outdoor track seasons. Much like his Hatters setting FCIAC and state records, Murray has collected a host of accolades. Named state coach of the year on several occasions for different organizations, he was inducted into the FCIAC Hall of Fame in 2017. The Hatters claimed their first outdoor track State Open in seven years earlier this month, further signifying they aren’t going anywhere anytime soon. Working with athletes on the individual level is what Murray noted is the most rewarding. Coaching at the largest high school in the state with a diverse population has presented a canvas to make an impact on the lives of many. Murray had an opportunity to coach at Southern after amassing success with the Hatters, but love for school and family was the prevailing emotion. Though scientific at heart, Murray added he hopes to keep honing his craft, including continuing to increase the exposure of his athletes to compete at the next level.